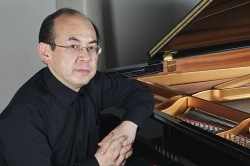 Mr Kawakami is an evangelist of Kapustin's music in Japan. After graduating from Tokyo University, Jun Kinoshita worked for Sony Corporation - primarily in its home video planning section - for over two decades. Jun is also a keen amateur pianist and won Third Prize in the Second Chopin International Piano Competition for Amateur Pianists in Warsaw in 2012. Jun left Sony in 2012 in order to work full time for his own company, JK Arts. Copyright 2014 JK arts. All Rights Reserved.